Biosecurity detector dogs can sense up to 200 things of plant and animal origin - but not insects. Innovative UNE research is working to change that. 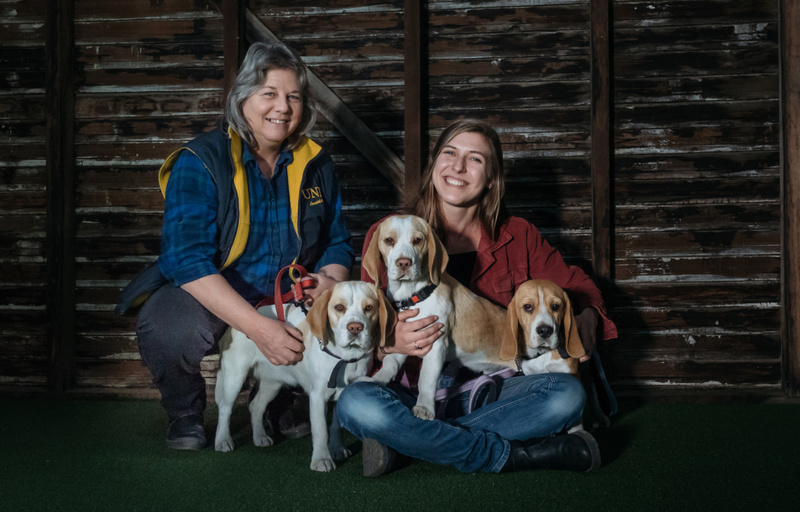 Image: Canine Scientist Dr Wendy Brown and Master of Rural Science student Ariella Moser with some of the beagles being used in experiments to establish whether detector dogs can work in the biosecurity frontline against insect pests. Dogs may soon be at the frontline of Australia’s biosecurity measures against insect pests, thanks to research being undertaken at the University of New England (UNE). Dogs’ phenomenal sense of smell is already an important part of Australia’s biosecurity program. Detector dogs have been trained to detect around 200 things of plant and animal origin — but so far, not insects. Supported by the Department of Agriculture and Water Resources’ (DAWR) Stronger Biosecurity and Quarantine Initiative, UNE researchers Dr Wendy Brown and Ariella Moser are well advanced with experiments in which dogs are showing strong promise as insect-detectors. “We don’t know what dogs can smell, and at what concentrations, so we’re establishing how readily they can detect key insect pests,” said Dr Brown, a canine scientist. The research is focusing on detection of the Brown Marmorated Stink Bug (BMSB), which has become a pest in many countries but not, so far, in Australia. However, BMSB incursions have been detected and stopped at border checks. Dr Brown and Ms Moser, a Master of Rural Science student, have been to Italy to collect BMSB scent, in collaboration with Italian BMSB researcher Dr Lara Maistrello at the University of Modena and Reggio Emilia. Back home, working with 15 beagles loaned by two Armidale kennels, they are now establishing how effectively dogs can pick up the BMSB scent in small concentrations, and whether they can distinguish the BMSB from other scents and insects. “We have found that dogs can readily detect an Australian stink bug we have worked with, but different species of stink bugs use different volatile compounds to deter threats,” Ms Moser said.